I was excited when I first heard Clarity were launching their Clarity Challenge Blog, the DT samples are gorgeous and very inspirational....then I had to make a choice!! I have dithered and dallied on this one ...problem being I admit to being a clarity stamp addict and as a result I have too many to choose from. I finally settled on one of my older stamps, I must admit I still rate this stamp as one of my favourites. a closeup of my hummingbirds and the trumpet flower background. I love working on dark card for this I used Clarity coated black card stock, I stamped the trumpet flowers with perfect medium and used Stampendous Kaleidoscope embossing powder ... it's white in the jar but when you heat it on black card, the magic happens, as you heat it more the colours change ...you can see on the plate behind the topper the range of colours it goes through. 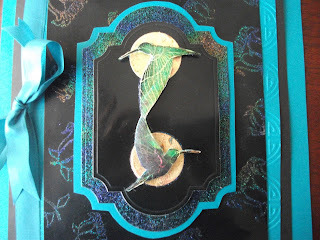 I stamped my humming birds on another piece of black coated card just for placement then I used a spellbinders die to cut it, I also cut 2 more mats using slightly larger dies, as I mentioned I used a piece of canvas textured card smeared with perfect medium and sprinkled with more kaleidoscope powder to make the glittery mat. 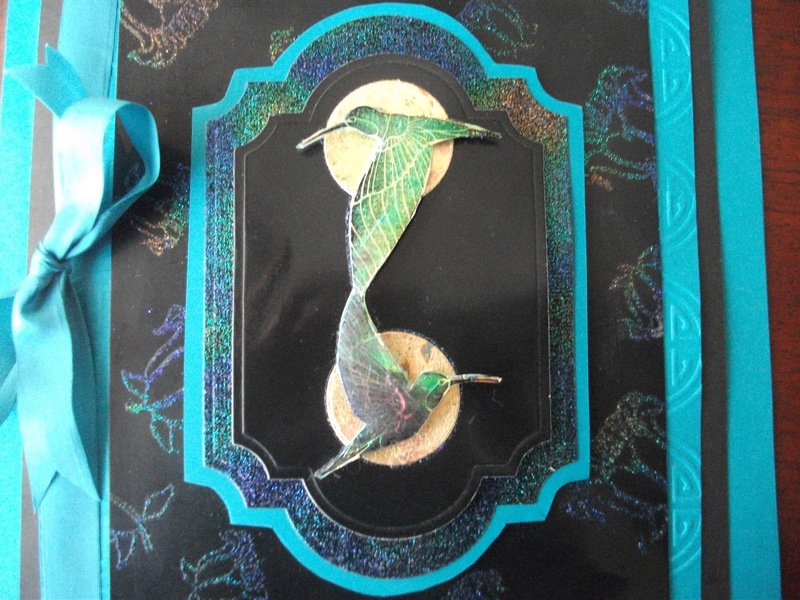 The moons behind the birds were die cut from a piece of card I had gilded with flitter glue and flakes, then I made my hummingbirds using fantasy fibres and cut them out and 3d them onto my moons. In keeping with the oriental feel I embossed a piece of teal card with asian embossing folder to put behind the black background. So there it is ... there are and will certainly be so many wonderful entries for this challenge but I just wanted to take part in this first Clarity Challenge.... hope you like it . 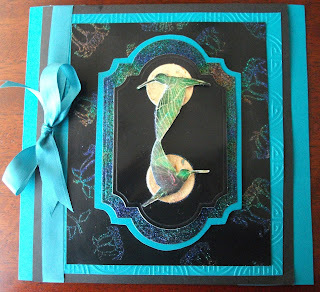 Hi Annie..this is a lovely card, I also love this stamp and they look fabulous with the Stampendous kaleidoscope embossing powder..I thought I'd ordered that one but I made a mistake so didn't get it..it's on my wish list now for sure !! Wow, Annie, very beautiful. I'm so glad you joined the Challenge, some of my favourite color combinations. Best of luck. Annie these are gorgeous colours indeed! A lovely card. Thanks for entering and really good luck!! !